Any flaws in the item will be shown and make sure the part listed is the one you need. PART NUMBER: 0001109306. IVECO PART NUMBER : 69502571. Other Part Number 69502571. Manufacturer Part Number 0001109306. IT IS BEEN REMOVED FROM IVECO DAILY 2.3 HPI 2008 YEAR. ONCE AN ITEM IS RECEIVED BACK IT WILL BE QUALITY TESTED ON OUR BENCHES AND CHECKED FOR A MATCH WITH THE ONE SOLD. PART NUMBER: 0001223003. IVECO PART NUMBER : 500307724. Other Part Number 500307724. Manufacturer Part Number 0001223003. IT IS BEEN REMOVED FROM IVECO DAILY 2.8 HPI 2003 YEAR. ONCE AN ITEM IS RECEIVED BACK IT WILL BE QUALITY TESTED ON OUR BENCHES AND CHECKED FOR A MATCH WITH THE ONE SOLD. 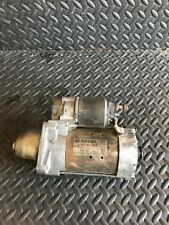 One Bosch remanufactured starter, part number SR98x or SR63x. This fits Manufacturer Part Number SR98x. VW Dasher with manual transmission 1974 - 1978. VW Dasher with automatic transmission 1974 - 1975. 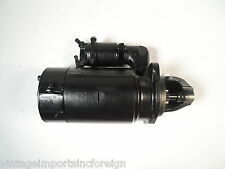 One remanufactured Bosch starter, part number S6345 or EGD0.6/6AR2. This fits Manufacturer Part Number S6345. Borgward Isabella 1956 - 08/1960 (6 volt cars). Warranty Type: Manufacturer Warranty. Warranty Duration: 1 year. Borgward Isabella 1956 - 1957. Opel Rekord 6 volt 1954 - 1959. This fits Manufacturer Part Number S6354. Other Part Number EGD0.6/6 AR27. BOSCH PART NUMBER: 0001115074. Other Part Number 0001115074. Manufacturer Part Number A0061517401. ONCE AN ITEM IS RECEIVED BACK IT WILL BE QUALITY TESTED ON OUR BENCHES AND CHECKED FOR A MATCH WITH THE ONE SOLD. Other Part Number SR0448X. Country/Region of Manufacture Germany. SEE PICTURES PLS ! ONCE AN ITEM IS RECEIVED BACK IT WILL BE QUALITY TESTED ON OUR BENCHES AND CHECKED FOR A MATCH WITH THE ONE SOLD. (MAKE SURE THE PART NUMBER MATCHES THE ONE YOU NEED). PART NUMBER: 0001223013. Manufacturer Part Number 0001223013. IT IS BEEN REMOVED FROM FIAT DUCATO 2.3 JTD 2004 YEAR. ONCE AN ITEM IS RECEIVED BACK IT WILL BE QUALITY TESTED ON OUR BENCHES AND CHECKED FOR A MATCH WITH THE ONE SOLD. PART NUMBER : 0986021193. Other Part Number 1387383R. Manufacturer Part Number 0986021193. IT IS BEEN REMOVED FROM DAF LF 45-170 2003 YEAR. ONCE AN ITEM IS RECEIVED BACK IT WILL BE QUALITY TESTED ON OUR BENCHES AND CHECKED FOR A MATCH WITH THE ONE SOLD. Manufacturer Part Number SR4405X. MPN SR4405X. Other Part Number 0001109205. (MAKE SURE THE PART NUMBER MATCHES THE ONE YOU NEED). ONCE AN ITEM IS RECEIVED BACK IT WILL BE QUALITY TESTED ON OUR BENCHES AND CHECKED FOR A MATCH WITH THE ONE SOLD. One Bosch remanufactured starter, part number SR158x. MPN SR158X. Manufacturer Part Number SR158X. Warranty Type: Manufacturer Warranty. Warranty Duration: 1 year. We make every effort to assure that we provide top quality and correct parts for any given application. PART NUMBER : 0001231016. Manufacturer Part Number 0001231016. (MAKE SURE THE PART NUMBER MATCHES THE ONE YOU NEED). ONCE AN ITEM IS RECEIVED BACK IT WILL BE QUALITY TESTED ON OUR BENCHES AND CHECKED FOR A MATCH WITH THE ONE SOLD. 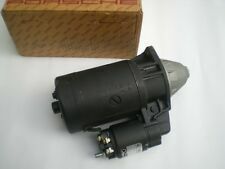 One remanufactured Bosch 6 volt starter, part number S6304 or Bosch # 0.001.154.007/004 or SR51X. This fits Manufacturer Part Number S6304. Opel Kadett 6 volt 1962 - 1965. Here is a very nice Bosch factory rebuilt original genuine Porsche starter 046.911.023 for 1976-79 924 models with automatic transmission. Wir sprechen Porsche! Interchange Part Number 046.911.023. Manufacturer Part Number 046911023. Model: SR6516X. MPN SR6516X. Manufacturer Part Number SR6516X. Bosch Premium Starters are designed, built and tested to provide the ultimate in performance and reliability. BOSCH PART NUMBER: 0001115070. Other Part Number A0061516101. Manufacturer Part Number 0001115070. ONCE AN ITEM IS RECEIVED BACK IT WILL BE QUALITY TESTED ON OUR BENCHES AND CHECKED FOR A MATCH WITH THE ONE SOLD. 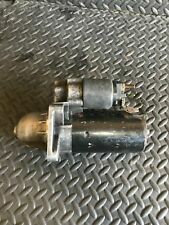 Starter Motor 2789060800 OEM. Manufacturer Part Number 2789060800 / A2789060800 / A 278 906 08 00 0800. Interchange Part Number W212 W221 W222 W216 W218 W164 X164. Interchange Part Number E550 S550 CL550 SL550 GL550 ML550 GLS550. PART NUMBER : 0001218162. Manufacturer Part Number 0001218162. IT IS BEEN REMOVED FROMDAEWOO MUSO 2.9 TDI 1999 YEAR. (MAKE SURE THE PART NUMBER MATCHES THE ONE YOU NEED). ONCE AN ITEM IS RECEIVED BACK IT WILL BE QUALITY TESTED ON OUR BENCHES AND CHECKED FOR A MATCH WITH THE ONE SOLD. IT IS BEEN REMOVED FROM BMW X3 3.0 DIESEL 2006year. BOSCH PART NUMBER: 0001115046. Manufacturer Part Number 0001115046. ONCE AN ITEM IS RECEIVED BACK IT WILL BE QUALITY TESTED ON OUR BENCHES AND CHECKED FOR A MATCH WITH THE ONE SOLD. BOSCH PART NUMBER: 0001218157. Manufacturer Part Number 0001218157. IT IS BEEN REMOVED FROMPEUGEOT BOXER 2.5 D. ONCE AN ITEM IS RECEIVED BACK IT WILL BE QUALITY TESTED ON OUR BENCHES AND CHECKED FOR A MATCH WITH THE ONE SOLD. PART NUMBER: 0001218162. Manufacturer Part Number 0001218162. ONCE AN ITEM IS RECEIVED BACK IT WILL BE QUALITY TESTED ON OUR BENCHES AND CHECKED FOR A MATCH WITH THE ONE SOLD. PART NUMBER: 0001108234. Manufacturer Part Number 0001108234. IT IS BEEN REMOVED FROMFIAT DOBLO 1.9 JTD 2006 YEAR. ONCE AN ITEM IS RECEIVED BACK IT WILL BE QUALITY TESTED ON OUR BENCHES AND CHECKED FOR A MATCH WITH THE ONE SOLD. PART NUMBER: 0001107429. Manufacturer Part Number 0001107429. IT IS BEEN REMOVED FROM OPEL COMBO 1.3 CDTI 2004 YEAR. ONCE AN ITEM IS RECEIVED BACK IT WILL BE QUALITY TESTED ON OUR BENCHES AND CHECKED FOR A MATCH WITH THE ONE SOLD. Model: SR2266X. MPN SR2266X. Manufacturer Part Number SR2266X. Bosch Premium Starters are designed, built and tested to provide the ultimate in performance and reliability. Country/Region of Manufacture Germany. Manufacturer Part Number 12411468117,12411711403 ,12411720246,12411288226. Interchange Part Number 0331303116-616. Interchange Part Number 0331303116. Interchange Part Number 0331303116616. STARTER PART# 12417843526. CABLE BASE B PART# 12427839662. Interchange Part Number 12427839662. Manufacturer Part Number 12417843526. 2007-2012 BMW M3 STARTER WITH BASE B CABLE, BOSCH, OEM. BMW M3 Convertible 2007 ,2008 ,2009 ,2010 ,2011 ,2012 ,2013 ,2014. PART NUMBER: 0001115046. Manufacturer Part Number 0001115046. IT IS BEEN REMOVED FROM BMW X5 E70 3.0 D 2007 YEAR RHD. 29 LESNOVSKA. ONCE AN ITEM IS RECEIVED BACK IT WILL BE QUALITY TESTED ON OUR BENCHES AND CHECKED FOR A MATCH WITH THE ONE SOLD. This is a good used starter for the Early Classic Saab 900 cars from 1980 - 1984. This might fit cars with the automatic transaxle but I am not sure. Country/Region of Manufacture Germany. Manufacturer Part Number 28502. Interchange Part Number 0001121028. Manufacturer Part Number 0001121006, 0001121007, SR0424X, 0001121028. Type Starter. Interchange Part Number 80-17781 11.131.054. Manufacturer Part Number 12417837775. BMW 3 Series M3 Convertible 2007 ,2008 ,2009 ,2010 ,2011 ,2012 ,2013 ,2014. BMW 3 Series M3 Coupe 2007 ,2008 ,2009 ,2010 ,2011 ,2012 ,2013. BMW 3 Series M3 Sedan 2007 ,2008 ,2009 ,2010 ,2011 ,2012. PART NUMBER: 0001231009. Manufacturer Part Number 0001231009. IT IS BEEN REMOVED FROM RENAULT MIDLUM 180 2005 YEAR. IN GOOD WORKING CONDITION. ONCE AN ITEM IS RECEIVED BACK IT WILL BE QUALITY TESTED ON OUR BENCHES AND CHECKED FOR A MATCH WITH THE ONE SOLD. PART NUMBER: A0141541302. BOSCH PART NUMBER: 0121813020. Other Part Number A0141541302. Manufacturer Part Number 0121813020. ONCE AN ITEM IS RECEIVED BACK IT WILL BE QUALITY TESTED ON OUR BENCHES AND CHECKED FOR A MATCH WITH THE ONE SOLD. OEM Part Number 1005821506. Other Part Number 1005821506. Interchange Part Number 1 006 209 554. Vehicle Color Code 668/9. Vehicle Color Schwarz II. Country/Region of Manufacture Germany. Manufacturer Part Number 1 005 821 506. PART NUMBER: 1387383R. Other Part Number 0986021193. Manufacturer Part Number 1387383R. IT IS BEEN REMOVED FROM DAF LF 45-150 2004 YEAR RHD. ONCE AN ITEM IS RECEIVED BACK IT WILL BE QUALITY TESTED ON OUR BENCHES AND CHECKED FOR A MATCH WITH THE ONE SOLD. Interchange Part Number W215 CL55 AMG. Interchange Part Number SL600 SL65 CL600 CL65 S600 S65 AMG. Starter Motor. Interchange Part Number Starter Motor. Interchange Part Number 01 02 03 04 05 06 07 08. Model: SR1309X. MPN SR1309X. Manufacturer Part Number SR1309X. Bosch Premium Starters are designed, built and tested to provide the ultimate in performance and reliability. Interchange Part Number R230 W215 W220. Interchange Part Number SL600 SL65 CL600 CL65 S600 S65 AMG. Interchange Part Number Starter Motor. Interchange Part Number 03 04 05 06 07 08. Item may show light scuffs, scratches or other imperfections as a result of thisbeing a used part. It has wear and tear, fresh from the barn shed. View photos, sold as it is. Model: SR4213X. MPN SR4213X. Manufacturer Part Number SR4213X. Bosch Premium Starters are designed, built and tested to provide the ultimate in performance and reliability. Other Part Number 996 604 103 00. PART NUMBER: 6004AA0003. OTHER NUMBER: 04793493. Other Part Number 6004AA0003. Manufacturer Part Number 04793493. IT IS BEEN REMOVED FROM CHRYSLER PT CRUSER. ONCE AN ITEM IS RECEIVED BACK IT WILL BE QUALITY TESTED ON OUR BENCHES AND CHECKED FOR A MATCH WITH THE ONE SOLD.